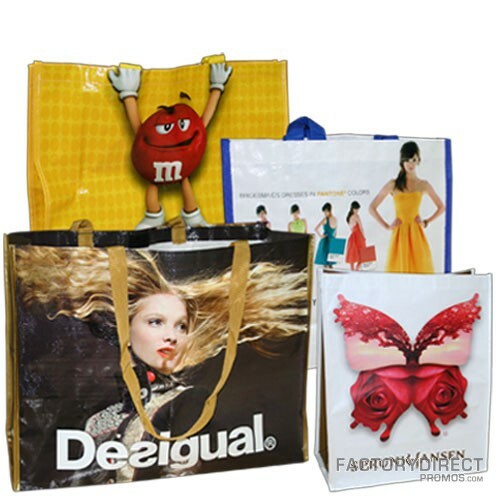 Create Custom Shopping Bags for Marketing or Retail Use, Now at a Reduced Price! Have you seen our most recent eco special? Get the most for your marketing budget or retail use and get your order in by August 31 to enjoy free setup (up to $500 value) on orders of 2500 to the millions on custom shopping bags. Custom reusable bags are good for your brand, and the planet, and thanks to our latest eco special you can score an even better deal on our custom shopping bags! Read on to find out how. Reusable shopping bags are a great promotional item because of their durable, reusable design. When your customers use your custom branded bag they will be reminded of your company and the products or services you provide, so your branding message will be reinforced. These custom bags will also function like signs, so when your customers carry your branded bag they will basically be carrying a sign spreading your branding message to everyone they encounter. When ordering our custom shopping bags, you can select the size to create a bag that is exactly what you want. Increase or decrease the size of the gusset or front and back panels to alter the storage capacity. Select the length of the handles or add pockets or a key ring to build function into your bag design. Full-color printing on all sides means you can make your marketing message pop. We can color match to your corporate colors, so your reusable bags will perfectly match the rest of your marketing pieces. Reusable bags are a green marketing item because by being reusable they eliminate the need and use of single-use or disposable bags. Single-use bags are a drain on nonrenewable resources, and are seldom disposed of in a responsible way, which further compounds their negative environmental impact. One reusable bag can do the job of thousands of disposable bags, making reusable shopping bags very eco-friendly. Our custom reusable bags are recyclable, so when the time comes they can be responsibly recycled, minimizing your brand’s carbon footprint. Ready to Place Your Order? We’re Here to Help! Let us know if you have any questions about the custom shopping bags, our capabilities or placing your order. Our talented team is at the ready to assist, answer your questions and help in any way possible. Get in touch by calling 866-222-0949, or you can request a quote through this page. Next Next post: Businesses Make Your Mark with Eco-Friendly Pens!